GALION — The Jonathon Alder Pioneers were in town to lock up with the Galion Tigers on Friday night in Mid-Ohio Athletic Conference Red Division play. Galion put up a fight but dropped the contest to the Pioneers by a final score of 43-16. The Tigers are now 0-2 in conference play while Alder moves to 2-0. Galion scored in the air on a 33 yard touchdown pass from Caleb Ivy to freshman Reuer. The extra point was blocked. Garrett Kuns also ran in to the endzone from the two yard line with Connor Moreton adding the extra point. Moreton also set a school record on the evening. He kicked a 47 yard field goal in the second quarter, breaking the previous record of 42 yards. Check back for more details on this and other area games as they come in. Senior Garrett Kuns carries the ball for the Tigers against visiting Jonathan Alder on Friday night at Unckrich Stadium. In the background is quarterback Caleb Ivy. Photo by Don Tudor. http://aimmedianetwork.com/wp-content/uploads/sites/38/2016/09/web1_Galion-FB-vs.-Alder-2.jpgSenior Garrett Kuns carries the ball for the Tigers against visiting Jonathan Alder on Friday night at Unckrich Stadium. In the background is quarterback Caleb Ivy. Photo by Don Tudor. 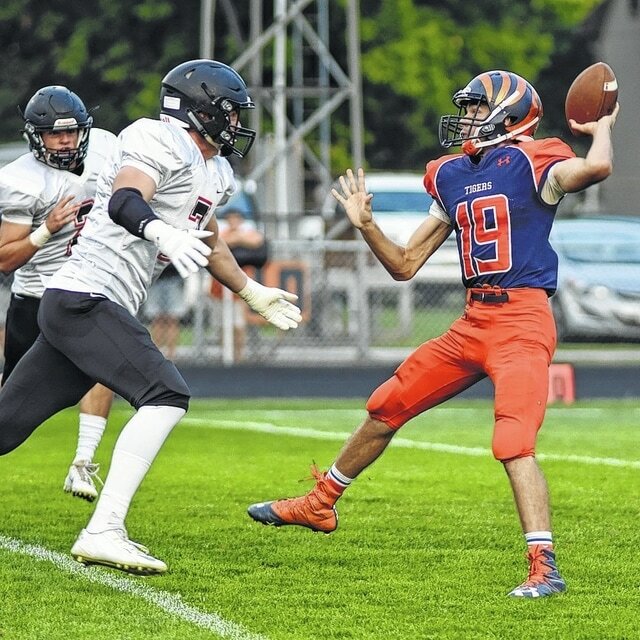 Galion quarterback Caleb Ivy throws an interception under pressure from Jonathan Alder’s defense on the second play of the game Friday at Unckrich Stadium. Ivy, playing for injured Chase Cook, later threw a long touchdown pass. Photo by Don Tudor. http://aimmedianetwork.com/wp-content/uploads/sites/38/2016/09/web1_Galion-FB-vs.-Alder-3.jpgGalion quarterback Caleb Ivy throws an interception under pressure from Jonathan Alder’s defense on the second play of the game Friday at Unckrich Stadium. Ivy, playing for injured Chase Cook, later threw a long touchdown pass. Photo by Don Tudor.